Sports injuries refer to injuries that occur during sports or exercise. While it is possible to injure any part of the body when participating in sporting activities, the term sports injuries is commonly used to refer to injuries of the musculoskeletal system. They can also result from acute trauma, or from overuse of a particular body part. Collisions on the playing field with other players or on the ground and unexpected sudden forces or wear and tear to the joints and limbs are the most common causes of Sports Injury. With the variety of different sports increasing with time, especially considering competitive sports and extreme sports, the frequency of sports injuries is increasing. Symptoms include pain in the affected or injured part of the body, pain, swelling, strains, sprains, spasms, fractures, etc. Apply ice immediately after a common sports injury. It works as an anti inflammatory, without many side effects. Don’t use heat during this time as it encourages swelling and inflammation. Over-the-counter pain relievers usually relieve the pain of common sports injuries but if they don’t, it is wise to visit the emergency room or your doctor. After the initial x-rays and scans, you doctor will guide you with options of treatment. In cases of most cases of injury, surgery is the usual suggestion. For many athletes who compete for a living, surgery and recovery take away a lot of time from their careers. Also, for people with no or minimal help with respect to care tacking, surgery is a difficult option. It also requires a lot of time and effort for post operative care, not to rule out the risk of infection whilst undergoing major surgery. People with other health conditions also avoid going under the knife. With the advancement of science and research, stem cell therapy has emerged as a new curative option in the treatment of different types of sports injuries. Stem cell therapy is a revolutionary treatment option to relieve and repair joint pain and injury without invasive surgical intervention. This therapy has potential to reduce pain with long lasting effects. Aimed at providing a cumulative and enhanced healing effect through multiple sittings of stem cell therapy, it would be especially be helpful in sports medicine allowing the athletes to return to sporting activity considerably earlier than the surgical route. Stem cell therapy is being used across the globed in developed countries to regenerate or re-grow tissue in the body that could not regenerate itself. 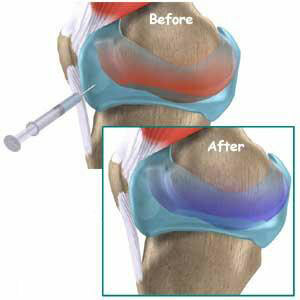 For example, many people suffer with torn cartilage in the knee. It was thought that the only type of treatment was to cut the tissue out with arthroscopy or to temporarily numb the area with cortisone injections. Now we have the ability to regenerate the tissue and avoid surgery with immediate pain relief.Stem cells also provide an anti inflammatory effect that facilitates quicker healing, besides for all its other benefits.